It isn't easy to break loose from the streamlined pace of modern living. It seems to follow you on the freeways and even crowd its way into most vacation spots. Crowded living isn't part of your stay at the Feather River Park Resort. It's one of the few places where you can escape to a simpler way of life. The unusual family vacation area is nestled into 160 acres of the breath-taking Mohawk Valley, Plumas County, California. 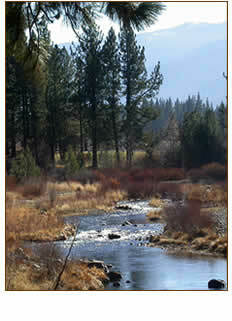 It's situated in the heart of the High Sierras "Lake Country." Meadows, canyons, streams, and dozens of crystal-clear lakes dot the countryside. The air is invigorating at 4,300 feet and at night the stars leap from the sky, dancing to the living sounds of nature. The serenity is real. If you're wondering how to shake the city "blues" and get away for a vacation, there is a simple solution: The real old-fashioned resort.